PHOENIX - In partnership with USA Baseball, Major League Baseball today announced the launch of its new "Pitch Smart" arm safety initiative for youth players. The announcement was made during the MLB General Managers Meetings. 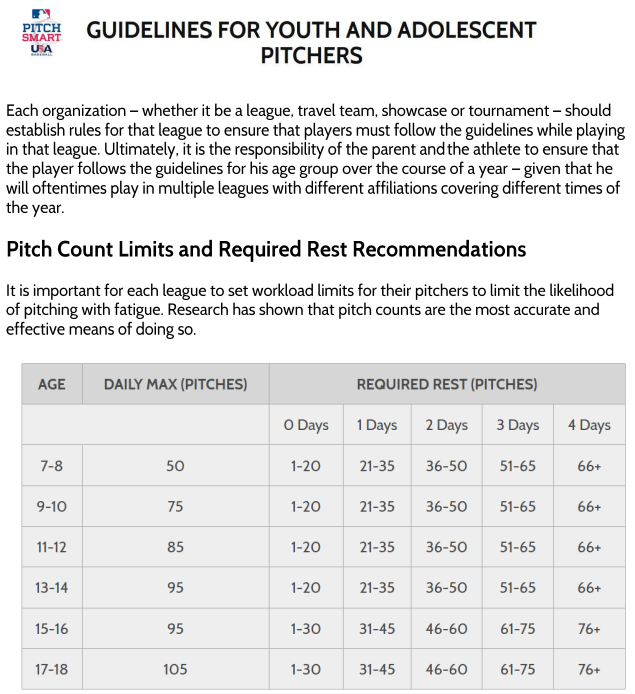 Pitch Smart will strive to provide a comprehensive resource for safe pitching practices, offering a series of practical, age-appropriate guidelines to help players, parents and coaches avoid overuse injuries and foster long, healthy careers. The guidelines were developed throughout the 2014 regular season, as MLB and USA Baseball collaboratively sought to pool the recommendations of many leading medical authorities in the sport in conjunction with baseball officials. PitchSmart.org will serve as the program's online home and will be accessible via MLB.com and USABaseball.com. The site offers pitch count and rest recommendations, statistics on Tommy John surgery, risk factors, awareness tips, published research and videos from experts like Dr. James Andrews and USA Baseball's medical safety committee chairman, Dr. Glenn Fleisig. USA Baseball, the national governing body for amateur baseball, will use PitchSmart.org as a major resource to educate the amateur baseball community on pitcher safety. Joe Torre, MLB's Executive Vice President of Baseball Operations, said: "Pitch Smart is our game's most extensive and unified endeavor on the issue of arm safety and reducing the incidence rate of Tommy John surgery. Pitch Smart combines the best expertise in the hopes of educating players, coaches and parents at every level of the game. Ultimately, we believe this program is a long-term step toward keeping present and future pitchers healthy as they progress through all levels of baseball." Paul Seiler, the Executive Director/Chief Executive Officer of USA Baseball, said: "As the national governing body for the sport, player safety is of the utmost importance to all of us at USA Baseball. With the support of MLB, USA Baseball looks forward to working collaboratively with its national member organizations on delivering a better and safer culture to the many participants in our great game."